Cupcakes are awesome. And the only way to make them even better, is to do something silly with them. It’s been too long to remember where I first saw a picture of a burger cupcake (which, admittedly, looked much more real than mine do), but I absolutely loved the idea. And since I was invited to a kids’ themed (2)6th birthday party recently, I thought it would only be appropriate to make some. *2 medium eggs are roughly 100 gr – when I want to be accurate, I crack my eggs, weigh them, and then add the same amount of sugar, butter and flour. 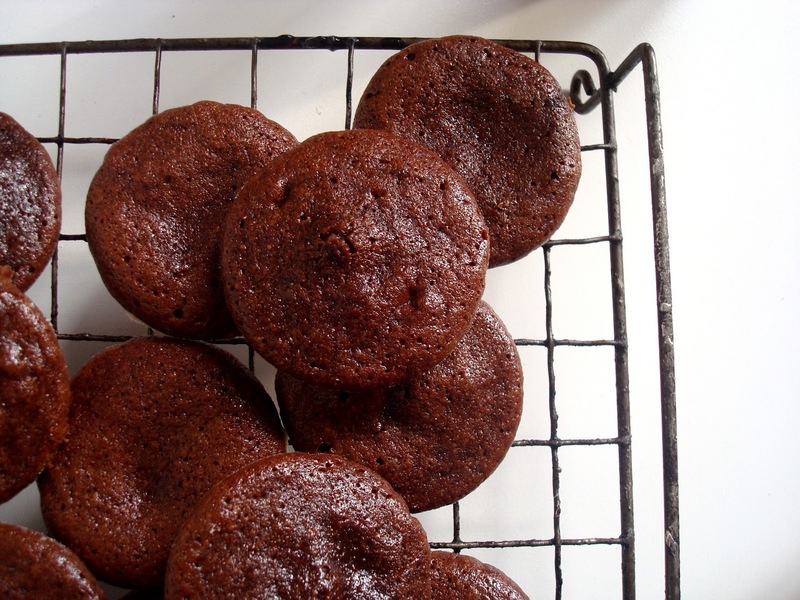 This is just the standard cupcake recipe so proceed in your favourite way! I cream butter and sugar, and then add everything else and mix using a whisk, until the mix is homogeneous. 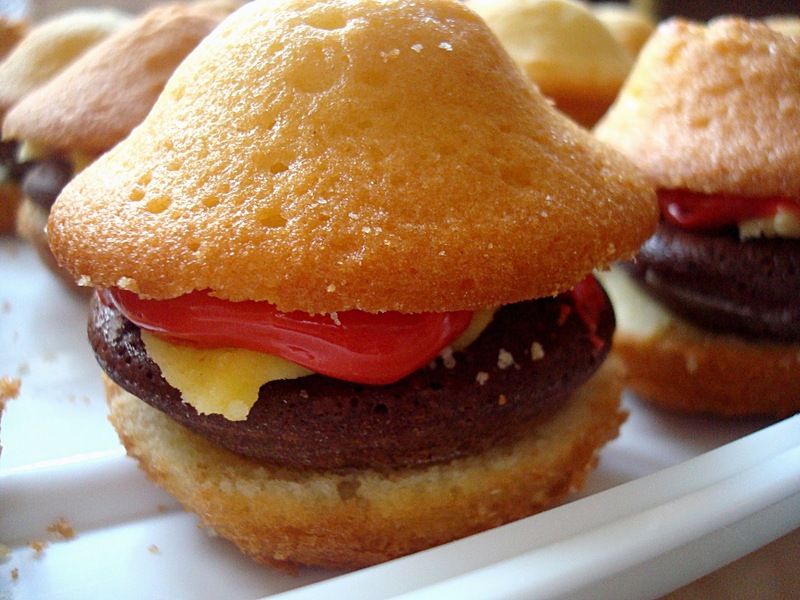 If you’re using cupcake cases for these, you want some with smooth sides. Or just butter and flour the cupcake tin and forget about the cases. Bake in a preheated (180 degree) oven for 10 minutes. Set aside to cool. Melt the chocolate and butter in a pan, add the sugar and alcohol and mix. In a bowl, whisk the eggs and add them to the chocolate mix. Finally, incorporate the ground almond and flour. Spoon the mix into a buttered and floured cupcake tin (for 12 cupcakes). Bake in a preheated (180 degree oven) for about 10 minutes. Remove and let cool. They will look tiny. They’re supposed to look tiny. Take a sheet of golden (yellow) marzipan, dust it with icing sugar and roll it out as thin as you can without breaking it. Cut 12 squares. Whisk the butter with the sugar until smooth and soft. Remember that the marzipan will be quite sweet, so you might want a bit less sugar in your icing than usual. Add enough food colouring to make it look like ketchup. Cut the (cooled down) buns in two. Pop a burger on the bottom half of the bun. Top with a cheese slice and spread with ketchup. Stay away from ex-McDonald’s workers who might have strong opinions about the correct procedure of burger-making. Enjoy! On another subject, I have finally bought my own domain, so now you can find my blog at www.kitchen22.co.uk, if you don’t fancy typing that extra blogspot bit. Old links should hopefully redirect fine – please let me know if you notice something wrong!